Midnyte Reader: The Iron Daughter. 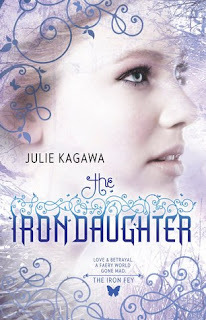 Title/Author: The Iron Daughter by Julie Kagawa. Favorite quote: “I am a cat.” Grimalkin. All in all: More of the same, but still fun, like your favorite soap opera. Familiar scenarios with a few surprises. I really did enjoy this continuation of Meghan’s journey in Faery but at the same time I was a bit conflicted at certain times while reading this book. I had just come from a journey with Meghan in The Iron King and now I was following her on another one to defeat another Iron “King”. Yet at the same time, there was a very good twist underlying this new development. The very few other reservations; references to iconic images as opposed to being shown what is happening, a few occurrences that I thought were confusing or glossed over and, I did feel the first book had more lyrical descriptions. However, Kagawa’s imagination is still evident in the journey and in the characters. There were some new faces that provided interest, secrets and moved the plot along. Meghan kept to her quest goal but at the same time had romantic issues to deal with. She still loved Ash, yet they were forbidden to be together. Part of me still wonders why. Is it just because the two Courts are enemies? Will there be earth shattering consequences if they get married and have a child or something? Why can’t they challenge this and get the rules changed? Anyway, in the midst of her broken heart there is Puck who showed some heart throbbing moments (and some very funny ones). While the love triangle didn’t bother me, some have compared it to Twilight since Meghan entertains the thought of a romance with Puck when she is convinced nothing could develop between her and Ash. Some may feel it’s fickle, but honestly I see it as realistic. Why shouldn’t Meghan explore her feelings? Especially when Puck made his so clear. But I feel that Meghan’s feelings for Ash went deeper. Yes, she does describe his appearance but she also describes his character when she reflected on what she misses about him. I understand that Meghan is only 16 but I was frustrated that she didn’t understand why Ash was keeping his distance at the Unseelie Court when she knew how dangerous it was there, when she was warned repeatedly and when she herself had seen what the Fay are capable of. Then she turns around and shows incredible maturity and grace at the school dance in the scene with Scott. As annoyed at her I was at the beginning, I was impressed with her in this scene. It showed me that she grew and learned about herself because of her journey. I don’t think it was something I could have done. Then, in the next breath she is jealous of Ash flirting with other girls. Okay, okay! I know she is only 16. I would have liked the reason why they went to the school dance to come about more organically however. The ending was my favorite part. I was thinking as I was reading this book that I would like to see Meghan in the real world applying what she learned about herself in Faery. (That’s what I liked best about the dance scene.) So, I am really looking forward to finding out what happens in the next book. The Iron Daughter was heavy with hints and I want to see if my hunches are correct. Hi :) I think I would really love this book it is going on my wish list. Your review is great. So glad to have found you at the Newbie Blog Hop at Lazy Girl Reads. Looking forward to following you :) Happy Holidays! Really fantastic review, loved all the questions you raised! I just adore this series and I think what I like about Meghan is she is both mature and immature and I think that's really realistic for a teenage character. Sometimes when they are overly mature, I have trouble with them because I know I wasn't brilliant and wise at that age like I am now;) Can't wait to see what you think of The Iron Queen, I just finished it and adored it. A lot of people are curious about what my thoughts are going to be on the 3rd one, LOL. I'll just have to wait till it comes out! Yes, Jenny I agree with the mature/immature aspect of her. Heck I'm still like that sometimes.